The age-long reverence for places of worship and religious leaders is increasingly eroding around the world. The unprecedented security threats to places of worship are diverse and alarming. They include: terrorist attacks, kidnapping of religious leaders and congregants, theft of relics and offerings, arson active shooter incidents, among others. Vigilance should be our watchword while within and outside a place of worship. Many places of worship (churches, mosques) etc. out there seem to have very lax security/safety, emergency preparedness plans. Granted God protects but we have to play our part of the bargain. The security department should consist of members of the congregation that have security background/experience and headed by a Security manager. Members of the security department are expected to undergo periodic security and first responder training/re-training and also have knowledge of basic first aid. A security consultant can be retained and private security operatives hired if need be. It is also important to have the contact details of security agencies within the locality. A security policy is a continuously updated template that figures out, outlines how the organization plans to protect its people and properties. A typical security policy should include specifics such as: procedures for evaluating the effectiveness of the security policy to ensure that necessary corrections will be effected; stipulates who is authorized to talk to the Press/Police in the event of an incident, that under-aged children will be released ONLY to their parents or an authorized adult after service and so on and so forth. The security department will do well to organize periodic security awareness training, seminar, or briefings for members of the congregation. These training’s should include comprehensive emergency (fire, terrorism/active shooter, health-related natural disasters) and evacuation drills/plans, lock-down procedures and scrutinize the aforementioned procedures regularly in response to plausible natural or man-made misadventure. Worshipper’s MUST be security conscious; try to know their members, recognize strange faces and report suspicious behavior to members of the security department. Periodic threat/risk and vulnerability assessments of the place of the facilities vis-à-vis location of the place of worship and crime demographic, identifying potential hazards, how secured the access or entry points are, fencing, untrimmed shrubs/trees, inventory of equipment among others. Recommendations must be put in place to mitigate such risks. Recent events demands that places of worship must re-think leaving their premises unlocked to such an extent that anybody can walk in and out. Promptly report suspicious packages to police, and do not touch the suspicious package. Such packages could be an IED (Improvised Explosive Device). Church members must be enlightened never to touch any suspicious package. Such issues must also be addressed during emergency evacuation procedures/drills. An efficient access and traffic control mechanism must be activate to detect, prevent a would-be suicide bomber from gate-crashing with IEDs (Improvised Explosive Devices) or VIEDs (Vehicle Borne Explosive Devices). As much as possible, limit unauthorized access to Sunday school, childcare, business offices, cash count areas, instrument/equipment and media rooms. It may be expedient to establish a “safe room” for the spiritual head of the place of worship. Ramp up perimeter security with fencing or CPTED (Crime Prevention Through Environmental Design) principles. Use planter barriers and gates near entrances. Ensure gates and fences are in perfect working order. Ascertain that security lights at vehicle parking spaces are sufficient and in working order. Where feasible, install door/window alarms and motion-sensing lighting in areas that are dim, secluded. Regularly trim shrubs/bushes/trees around the place of worship especially near the doors and windows to eliminate hiding places and to enhance visibility. Religious centers will do well to establish good relationships with their neighbors and neighborhood watch associations. Thanks to the proliferation and affordability of security gadgets, financially established places of worship are encouraged to invest in some of these devices. For instance, an efficient CCTV Camera, metal or bomb detector will respectively help monitor the premises in real time, protect against intrusions, and concealed weapons, IEDs or VBIEDs. Please ensure whatever security gadgets you want to buy are tested prior to purchasing them to ascertain they work according to specification. In buying a metal or bomb detector, ensure it is easy and safe to use. For CCTV Cameras, go for high-end security cameras with night vision capability, motion detection capability, consider storage capacity and ability to save videos/pictures externally, weather resistant, high definition (HD) capability (though consumes more storage space), can discriminate objects at farther distances (say 75-100 feet), wide angle of coverage, among others. Note that wireless cameras slow down internet connections. There are no one-size-fits-all answers to an active shooter security incident but knowing what to do or what action to take will definitely save lives. Prepare your mind! An Active Shooter would rather deal with an unaware, careless group of people/ persons than an aware one. 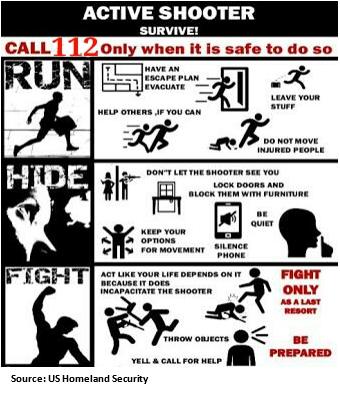 Preparing yourself mentally will assist the you in preventing and defusing a situation before deadly force becomes necessary. Below are Color-Code Systems for Mental Conditioning that trains you towards a mindful state of awareness and allow you to move from one level of mindset to another while enabling you with the ability to properly handle a given situation. (Alpha Outpost: Mental Conditioning, Omar Gonzalez). Black – This is a condition that you must Avoid! These Color Codes have nothing to do with combat skills, marksmanship, or tactical training, but rather your state of mind. ( Emergency numbers to call in Nigeria are 112/ 911). Thanks to Don Okereke for the insightful article. I hope this can be circulated to churches especially. Yes, there has been repeated gun attacks on churches, not just by terrorists. Offerings are targeted, clergies are targeted, car parks of churches are targeted, and so on. The church seems to be prime target for criminals lately.